Paper! It always finds its way into our homes. 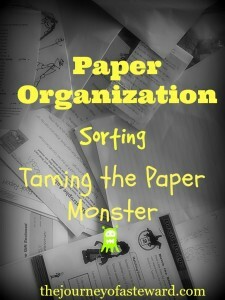 Everyone around us feeds our paper monster. It walks in the front door delivered by the mailman and our children’s teachers. Sunday School papers, newspapers, instruction booklets, pamphlets and receipts, need I say more? The paper monster is insatiable, it never stops. I know it is near impossible to get rid of the paper problem, but we can at least tame it! I know for me, it is next to impossible to file every piece of paper in my home in one day. And we know, from our 12 Week Home Organization Overhaul.. found right here 🙂 http://thejourneyofasteward.com/12-week-home-organization-overhaul.html , that the best and only way to eat an elephant is one bite at a time! The last thing we want to do is get started and become so overwhelmed and frustrated that we either quit and give up or we leave our house in disarray with paper piles everywhere. My plan is to set up a temporary station in my closet that I can work out of and I can keep some things out without driving me totally insane. My ultimate goal in this paper organization project is to have everything filed digitally. Now, obviously there are many steps from the paper piles taking over my table and bed from my social security card adventure to everything in its place and filed so nice and neatly digitally. I would love for you to join me on this adventure! It might get a little scary and dangerous trying to fight this monster that is overtaking our homes, but we are warriors. We will prevail! (If you have an extra heavy pile of something ie. homeschooling feel free to add a box. You need it to fit your needs). Now, pick a pile or cabinet with a pile of papers and ready, set , sort! Work as long as you available to. When your time is up, if you are not done, stick your weapons in the closet. Schedule a set time to come back. Take out the trash. Good luck! Let me know how it goes. P.S. 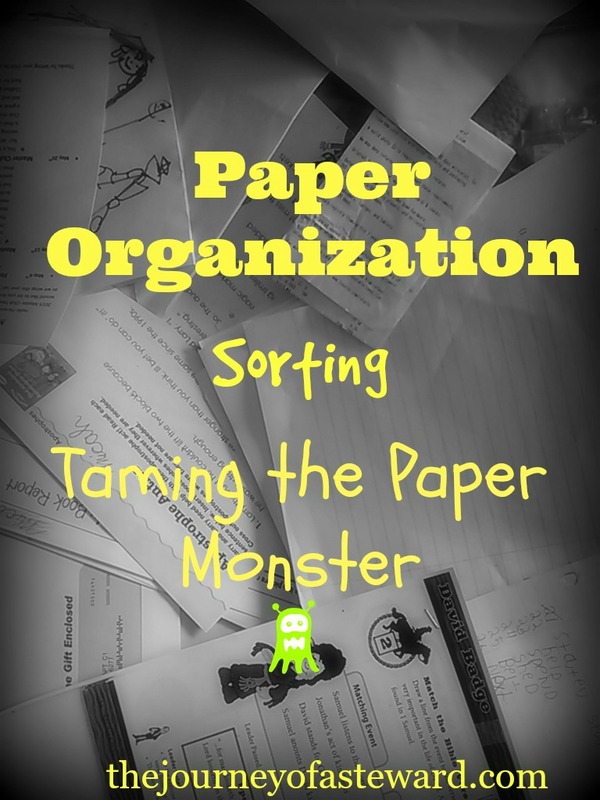 Depending on the size of your paper monster your sorting may take several days, but do not give up! We will tame this monster and keep it from causing chaos in our lives. The shredder makes it more fun somehow. Getting those piles into categories really makes a difference too. I seriously need to get a shredder. I used to have the paper monster under control until my paper shredder broke. Now I postpone because it means cutting documents into little, itty, bitty, pieces,. I understand as I use to have a pile to take to my mom and dad’s to burn and inevitable don’t. The shredder and I now have a wonderful relationship 😉 ! Thanks for stopping by!